Raw fermented organic nut cheeses, crafted by hand. We are an artisanal plant-based cheese producer. 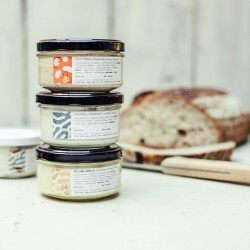 Our tangy, creamy cashew and almond nut cheeses are made using the traditional process of fermentation, which creates beneficial enzymes, various strains of gut-friendly live cultures, b-vitamins and minerals. Our products are also good sources of plant protein and healthy fats. All our cheeses have no additives or preservatives, are all natural, full of goodness and live! They're delicious as a spread and make a great alternative option for people who follow a dairy free or plant-based diet. Gluten free and dairy free.